I love Christmas. I have to with my job as a Santa photographer. It's not a job you can do and not really love Christmas. At the mall, people can't believe we're there taking pictures early in November. Most people want to get through Thanksgiving before even considering Christmas. Me? I could listen to Christmas music all year. It truly is the most wonderful time of the year. And it's not just about the hustle and bustle of the holidays, the music, the presents, the parties, the cookies... it's about Christ. In our modern, very secular Christmas, the Savior seems to get lost in the shuffle. And that's a shame. But it doesn't have to be that way. It is possible to find Christ amongst the world's view of Christmas. When I was in college, I had a professor who opened my eyes to the symbolism of Christ found all around us. And that's what I want to share with you all today. The Christmas tree... 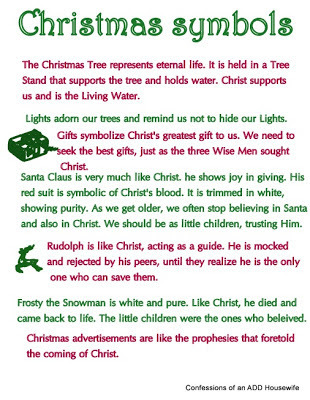 The green of the tree represents eternal life. It is held in a tree stand that supports it and provides it with water. Christ supports us and is the Living Water. The Lights adorn our trees and remind us not to hide our lights. They shine for all the world to see. At Christmas, we give gifts to symbolize Christ's greatest gift to us. We need to seek the best gifts, just as the Three Wise Men sought Christ. 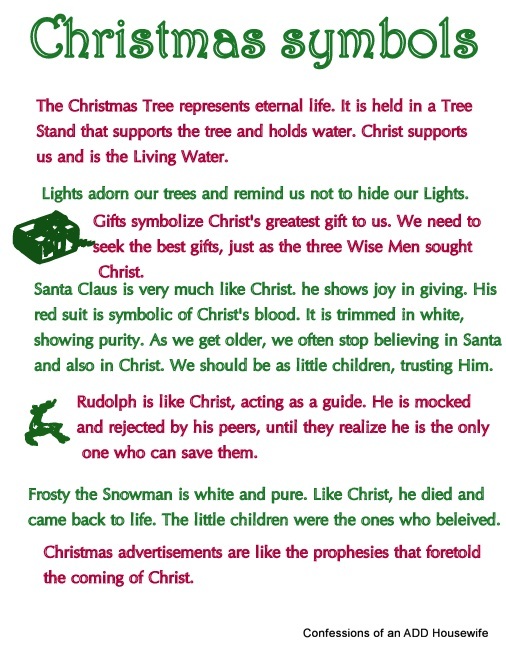 We can even find Christ in Santa! Santa shows joy in giving. His red suit reminds us of Christ's blood. It is trimmed in white, reminding us of Christ's purity. As we get older, it becomes harder to have faith in Santa and in Christ. We need to be as little children, trusting Him. Rudolph, with his nose shining, guides us through the night. Christ is truly our guide. Rudolph was also mocked and rejected by his peers until they realized that he was the only one who could save them. And dear old Frosty...white and pure. He melted (died) and came back to life. And it was only the small children, full of faith who believed in him. That sounds familiar, doesn't it? As much as we hate seeing Christmas in the stores in September and all the advertisements, remember that Christ's birth was foretold. Just think of the early advertising remind us to prepare the way for Christ. And, I made this into a printable, I think. It's right here. I've never done a printable before...so yay. Let me know if it doesn't work! I love it!! Thank you for sharing your printable!